Family friendly 5 star beach hotel with 147 rooms and suites and offering stunning panoramic views over the Mediterranean to Gibraltar and Africa. The exclusive Poniente Suite has its own penthouse bar, personal butler and private lift. Delightful semi-tropical gardens with three pools (one heated) run down to the beach. The hotel has four restaurants, spectacular buffet breakfast and fine dining, spacious, sophisticated comfort, friendly service, Kids’ Club, water sports. All rooms and suites have high-speed Internet and WiFi connection, LCD satellite TV, pay-per-view channels, individual heating and a/c control, minibar and in-room safety deposit box. They all have 1 double or 2 single beds, pillow menus, dressing gown and slippers for guest use during stay; large bathroom with separate bath and shower, bidet, hairdryer and scales. Communicating rooms, rooms specially adapted for the use of disabled guests. Maximum occupancy in each room is 2 adults plus one extra: either an adult or child sleeping on the sofa bed, or a baby in a cot. In the suites, maximum occupancy is 2 adults plus two extra: an adult or child sleeping on the sofa bed, and a baby in a cot. 462 m2 (200 m2 interior, 261 m2 exterior): Reception room with fireplace, dining room and American kitchen, surround sound system and games centre. Large bathroom with separate bath and shower and wooden floors. Private outside terrace with jacuzzi, mini-golf, dining area and double day bed. Upper terrace of about 60 m2 with Sky Bar, professional quality telescope and day beds. 165 m2 reception room with surround sound system and games centre. Private outside terrace with great sea view, day beds. 150 m2 living area. Private terrace with jacuzzi and great views out to sea. Outside dining area with divan and day beds. 100 m2 living area. Private terrace with day beds and complete view of the sea. 100 m2 living area. Private terrace with day beds and side view of the sea. 80 m2 living area. Private terrace with day beds and side view or complete view to sea. 42-45 m2 living area. Balcony with complete sea view. 42-45 m2 living area. Balcony with lateral sea view. 42-45 m2 living area. Balcony with restricted sea view. 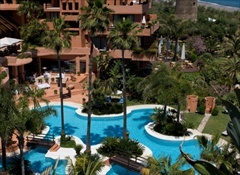 Full concierge service, reception 24/7, multilingual staff speaking Spanish, English and German, doctor on call 24/7. Wireless internet available in all public areas and meeting rooms, internet corner with 2 PCs, high-speed internet, web-cam and mike (additional charge for internet use). Evening turndown service; daily laundry and pressing service, dry-cleaning service Mon-Fri, iron and ironing board available for guest use on request. Hotel boutique, open by appointment. Babysitting on request. 25 privately owned flats and apartments are available for rent in the Private Wing. Each one is individually decorated, and features spacious interiors, balconies or terraces. Private Wing residents have the use of all hotel facilities. Contact Stylish Places to Stay for details and prices. Special rates available for children (seasonal). The hotel accepts the following credit cards: Visa, MasterCard, American Express and Diners Club. Low season: No charge for cancellations up to 48 hours before the date of arrival. Mid-season and high season: For cancellations made less than 7 days before the date of arrival, one night’s stay will be charged. MIRADOR: Indoor and open-air cafeteria with a first-class breakfast buffet. Open daily for breakfast 07:30-11:00. LA CABAÑA DEL MAR: Mediterranean seafood restaurant in the beachside gardens, max capacity 240. Alfresco in summer, it is transformed into a winter garden restaurant in the cooler months of the year. Open daily for lunch 13:00-16:30. LA BRISA: Italian cuisine. Open Thur-Mon for dinner 19:00-23:00. ALMINAR: Spanish haute cuisine. Open Tue-Sat for dinner 19:30-23:30. ALMENARA TOWER: Tête-à-tête private dining in the Almenara Watchtower overlooking the sea. Private butler and sheer romance. Max 12 persons. Reservations and evenings only. Seasonal. BAR MISTRAL: Cosy, modern second-floor bar/reading room flooded with natural light. LA VERANDA BAR: On the terrace. Open 09:00-02:00. Light meals served 12:00-23:00. POOL BAR: Open for drinks and snacks 13:00-15:00 all year (weather permitting) except in July/August 11:00-18:00. SALON PONIENTE: 282 m2, 5m high ceilings. Max capacity 240 for a reception, direct street access, top end technology for meetings and presentations. Ideal for car/product launches. Can be divided into two equal rooms. SALON LEVANTE: 90 m2, 3m high ceilings, natural daylight, direct street access, top end technology. Max capacity 40 for a reception. May be used for meetings or as an adjunct breakout room. SALON TERRAL: 92m2, opening onto terrace overlooking gardens and sea. Max capacity 100 for a reception, ideal for meetings with coffee breaks on the terrace. Can be connected to Salon Sahara, total space 172 m2, max total capacity 160. SALON SAHARA: 80 m2 featuring outdoor terrace overlooking gardens and sea ideal for meetings with coffee breaks in the open air. Modern technology available. May be divided into two separate areas or joined with Salon Terral, total space 172m2, max total capacity 160. SALON SIROCO: 40 m2 boardroom, featuring modern technology, natural daylight. Max capacity 20.
BUSINESS MEETINGS, conferences, product launches, incentive get-togethers, annual board meetings: The hotels professional events team excels at putting together a tailormade programme for your event, with whatever state of the art facilities, technological knowhow, menu planning, setup, facilities and accommodation you need. BUSINESS CENTRE: Internet corner for personal use. Secretarial, translation, email and fax services; high-speed wireless Internet connection, printing/photocopying/scanning, CD burning, DHL shipment, stationery. WEDDINGS: Whether you plan a small, intimate wedding or one with a guest list of several hundred, the hotel will tailor it to your requirements. Personal wedding planner, wide choice of menus, indoor or alfresco venues, music, fireworks, flowers, private transport and accommodation for wedding guests. IN THE HOTEL: WATER SPORTS AREA (seasonal). 3 OUTDOOR POOLS (one heated) in tropical gardens beside the beach. BEACH VOLLEYBALL COURT. TENNIS COURT. KIDS´ CLUB: For children 4-12 in summer and special dates. FITNESS STUDIO: Enjoy a daily workout with 7 exercise machines. Personal trainer on request. OUTSIDE HOTEL: GOLF: Over 40 golf courses several of championship standard, are in the area.RIDING: ESCUELA DEL ARTE ECUESTRE, 5 mins. from the hotel. 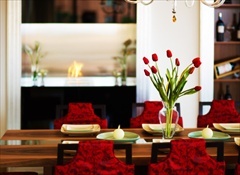 Reservations can be made via the concierge. DISCOVER ANDALUSIA: Most of the ancient Andalusian cities are within a 2 hr drive. ASCARI RACE RESORT, Ronda: Learn to drive a Formula 1 car. Approx. 90 mins. from hotel. OUTSIDE SPAIN: GIBRALTAR, visit the historical Arab fort, military garrison and the ape colony, 55 mins. by car. TANGIER, MOROCCO: 45 to 60 minutes by high-speed ferry from Algeciras, Gibraltar or Cadiz. Visit the Medina (old quarter) and bazaar. Spa area with sauna and Rasul bath. Massage sessions, beauty treatments. HEATED INDOOR POOL. Smart casual dress is recommended in La Veranda Restaurant. Guests wishing to smoke are asked to specify ´smoking room´ when booking. Inside the hotel, guests may smoke in their rooms only; no smoking is permitted in the restaurants, bars or public areas. Pets accepted to a max weight of 5 kgs., daily rate USD 29/20 euros + VAT. MALAGA airport: 82.3 km/56 min from the Hotel. GIBRALTAR: 52.1 km/55 min. If your departure is from Gibraltar, add 1 hr to your arrival time at the airport to compensate for possible traffic holdups. The hotel is located beside the Autovia del Mediterráneo (A7), which has an exit onto the Autopista del Mediterráneo motorway within 2 kms. Private chauffeur driven car service available for excursions and airport transfers. Luxury sports car rental service available: BMW, Mercedes, Maybach, Ferrari, Lamborghini, etc. Transfers from Málaga Airport to the hotel by private helicopter. Covered parking USD 18/12 euros + VAT per night; parking outside the hotel is gratis. The hotel is on the beach 10 mins from Estepona, a small town which still keeps the atmosphere of the fishing village it once was. 15 mins from Puerto Banús, famous for its chic shops, nightclubs and world class yacht marina; 20 mins from the old town of Marbella, its Mozarab architecture and fascinating maze of cobbled streets, small shops and bars. 5 mins walk along the beach to the bars, restaurants and glamorous wardrobe top ups of Laguna Village.